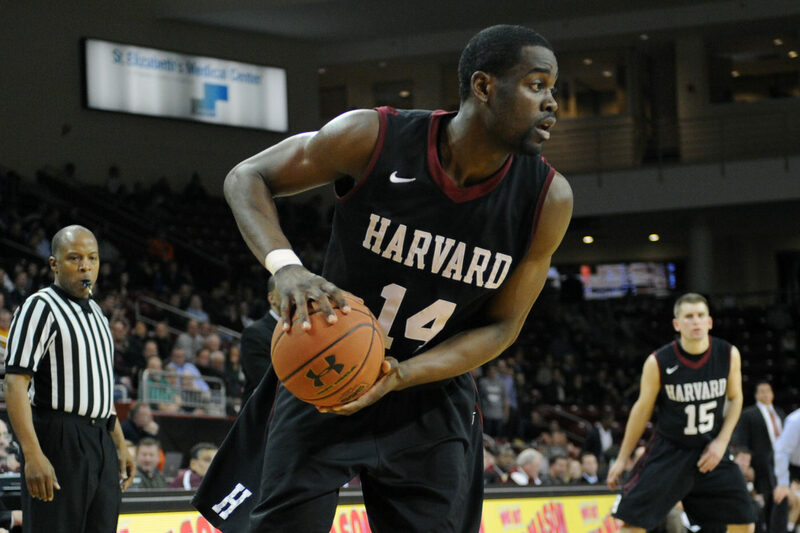 Harvard coach Tommy Amaker is trying to figure out how best to utilize—but not exhaust—reigning Ivy League Player of the Year Wesley Saunders ’15. 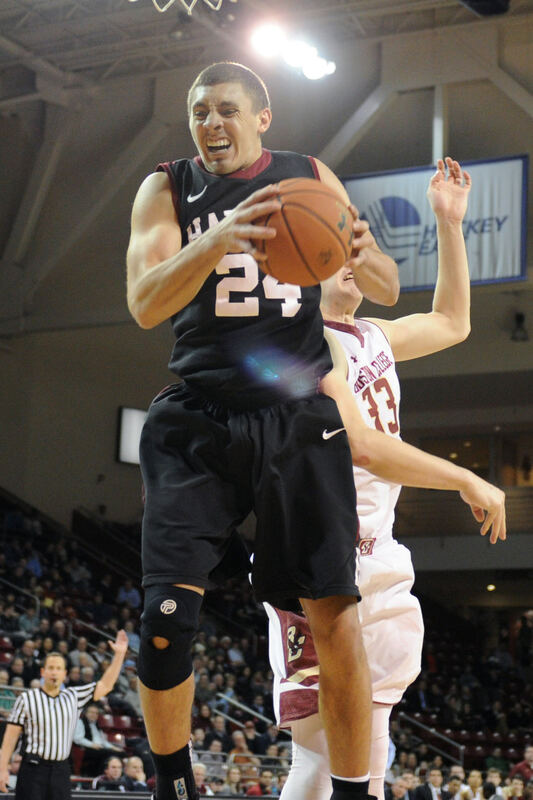 Senior co-captain Steve Moundou-Missi helped anchor a strong Harvard front court in the win over Bryant. Moundou-Missi's classmate, Jonah Travis, provided the Crimson with valuable production off the bench against both Boston College and Bryant. On Tuesday, thanks primarily to strong post play from Zena Edosomwan ’17 and Steve Moundou-Missi ’15, the Crimson defeated Bryant 66-57. The victory suggested that Harvard has begun to overcome some of the tactical problems that have bedeviled the team all season and, more significantly, that players are starting to internalize the importance of interdependence. The win over the Bulldogs was valuable in part because Harvard’s performance against BC revealed that the team was still wrestling with many of the challenges that have afflicted it all season. It also made one of those difficulties far worse. Harvard has repeatedly sought more production from its post players, and with conference play approaching, many had hoped that starting center Kenyatta Smith ’15 could emerge to fill that void, just as he did during the second half of the 2012-2013 campaign. But late in the first half against BC, Smith collapsed to the floor, writhing in pain after spraining his knee. According to Amaker, the senior big man—who missed all but one contest during the 2013-2014 season after suffering a stress fracture in his foot—is out “indefinitely.” Thus, the BC game was not just a loss; it also marked the loss, for at least the time being, of one of the team’s best players. That the squad was unable to string together strong halves against BC underscores the biggest difficulty this year’s team faces: learning to play together. Each of Harvard’s past league champion teams had multiple players—including Keith Wright ’12, Kyle Casey ’13 (’14), and Laurent Rivard ’14—who could take over a game. On this current team, only Saunders has demonstrated the ability to do that consistently. 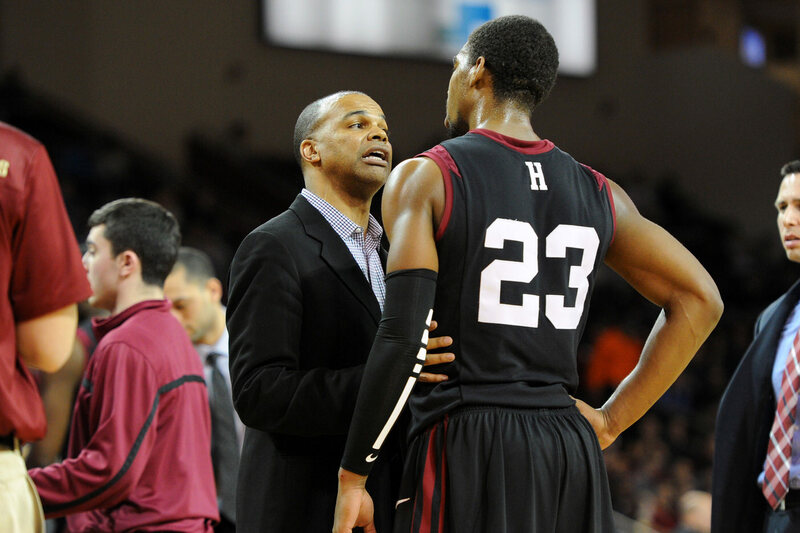 As a result, and as Amaker observed, the players need to learn to “rely” on each other in a way that past teams did not. Against BC, they did that for only part of the night, so Harvard’s six-game winning streak against the Eagles ended—and the concerns about the Crimson were amplified. If the BC game raised questions about Harvard’s personnel and constancy, the conclusion of the game with Bryant showed that they are capable of answering them. With just under four-and-a-half minutes remaining and the game tied at 55, Amaker brought Saunders to the bench for a rare respite. For most of the night, he had been guarding the Bulldogs’ star player, Dyami Starks. Now that task fell to Agunwa Okolie ’16. During the remainder of the contest, Starks attempted three shots—but with Okolie hassling him, he missed them all. In a crucial moment, while reducing the load on Saunders, the Crimson defense held stout. Meanwhile, Harvard’s post players demonstrated that they could score in Smith’s absence. With 3:45 remaining, forward Moundou-Missi was fouled while scoring a layup; he also sank the free throw, which staked the Crimson to a 58-55 lead. After Bryant cut the deficit to 58-57, Edosomwan (who started in Smith’s place) scored a layup to push the margin back to three. In total, Moundou-Missi and Edosomwan tallied 28 points, including nine in the final four minutes. The Crimson big men showed that they can produce. One might well argue that it’s silly to celebrate the last minutes of a narrow victory over Bryant: a win against a middling program, following a disappointing loss. Yet it is also unreasonable to malign a squad for failing to live up to preseason rankings and expectations that others imposed upon them. It is now clear that this year’s team lacks the offensive firepower of its predecessors and, more importantly, has relatively little experience. Each member of last year’s starting five—Siyani Chambers ’16, Moundou-Missi, Saunders, Casey, and Rivard—had played in the NCAA tournament, and many had spent time playing together. But this year’s starting lineup features two players, Okolie and Smith, who played sparingly last year and relies heavily on Corbin Miller ’15 (’17), who devoted the last two years to a Mormon mission before returning to the team. Rather than fretting over the Crimson’s apparent shortcomings so far, guard Matt Brown ’14 (’15) offers a more optimistic perspective: the fact that the team has yet to click means that they are “full of potential,” with the opportunity to “peak” in league and postseason play. Brown knows a thing or two about this, having won a total of six Ivy League championships as a wide receiver on the football team and a guard on the basketball team. Will the Crimson realize Brown’s vision? Beginning with a home game against Dartmouth on Saturday, Harvard has 13 conference games to gel and claim the program’s fifth straight Ivy League championship. Based on its performance today, that outcome feels neither comfortable nor convenient, but achieving it could prove extremely special. The Harvard women’s basketball team also concluded non-league play on a strong note, defeating the New Jersey Institute of Technology 66-54, recovering from a nearly disastrous start. Less than eight minutes into the game, the Crimson trailed 20-4 and All-Ivy senior Temi Fagbenle was on the bench with two fouls. But thanks to Fagbenle’s discipline (she didn’t commit any fouls for the rest of the game) and her outstanding production (22 points on 9 of 16 shooting), the Crimson mounted a victorious comeback. Head coach Kathy Delaney-Smith’s squad (now 7-8 on the year) will now look to its avenge its recent loss to Dartmouth when it resumes league play in Hanover on Saturday.